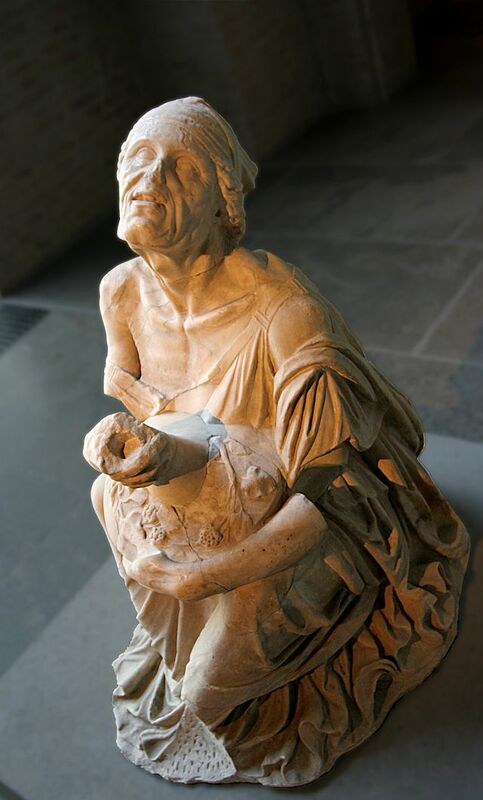 The Old Drunkard, Glyptothek, Munich. – Image source here. More often than not, we tend to turn our eyes away from poverty and the poor, the blemish on the conscience of our society in which everything exists in abundance and in which no one would have to suffer from absolute poverty if there were any actual will to address the issue that lies in the deeply unjust spread of wealth. More often than not, we tend to reach for the insulting, yet convenient, assumption that the poor and destitute themselves are somehow to blame for their situation, and that therefore, if only they tried harder, they could end it without any fundamental changes. Unfortunately, there is no simple cure for coldheartedness. Unfortunately, there is no political will to effectively end poverty – not even for those who least deserve its effects and who are least likely to be able to fight it: children, the sick, and the old. Unfortunately, some people will simply not get the (not at all subtle) distinction between poverty chosen for oneself (e. g. for religious reasons) and poverty of the masses, across the globe, that no one chose – and that no one deserves. [peres – – -]SY h(ic) s(itus) e(st). … is buried here. May your bones rest well. hic carnis spolium liquit a[d] astra volans. perpetuis, caelum donis terrestribus emit. officio vixit minimus et culmine summus. subiectasque videt nubes et sidera caeli. Hilarius, priest of the most holy law, rests here. Hilarius, the Lord’s priest, who, preferring the love of poverty over gold, took possession of the heavenly realm, who regarded death and Christ being alive as victory prizes, contemptuous of the frail use of the earthly body, he left behind the spoil of the flesh, flying to the stars. He despised possessions, while he sought the means to change things mortal continuously, and he bought heaven with earthly gifts. A gem of priests and a teacher of the people and the world, taking on even rural duties for Christ, not dishonoured to approach slave-like compliance, he lived most humbly in gesture, yet he was the highest in rank. No wonder if, subsequently, he deserved access to your doorstep, Christ, and entered the dwellings of the angels and their golden realms, he sees, Paradise, your riches, eternally gleaming pastures and gardens breathing the scent of divine flowers, the clouds below as well as the stars of heaven. The Beggar. 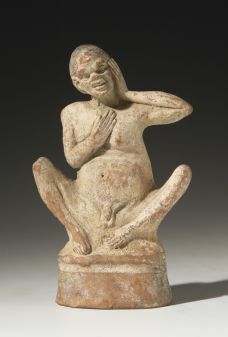 Terracotta statue, Antikenmuseum, Universität Heidelberg. – Image source: http://www.landesmuseum-trier.de/lib/05_Ausstellungen/armut/hd_28-18_a.jpg. Enviable, to be able to afford such poverty. But what does involuntary, destitute poverty in ancient Rome sound like? Occasionally, one encounters the view that the poor simply do not have a voice, to state their case, to fight their cause. Maybe this is true. Maybe it is not. Maybe we are just too busy listening to the wealthy and affluent, who try to protect their wealth, that we refuse to hear the voices of the poor – voices that are mentioned not only in the writings of Rome’s literati, but also recorded, on occasion, in the corpus of Latin inscriptions. Strangely, a recent edited volume on Poverty in the Roman World, edited by Margaret Atkins and Robin Osborne, does not appear to contain any contribution that explores the voices of those who purported to be poor in the inscriptions. But that does not mean they do not exist. Francisca Feraudi-Gruénais has produced an excellent study on them, for example, focusing on the city of Rome herself. 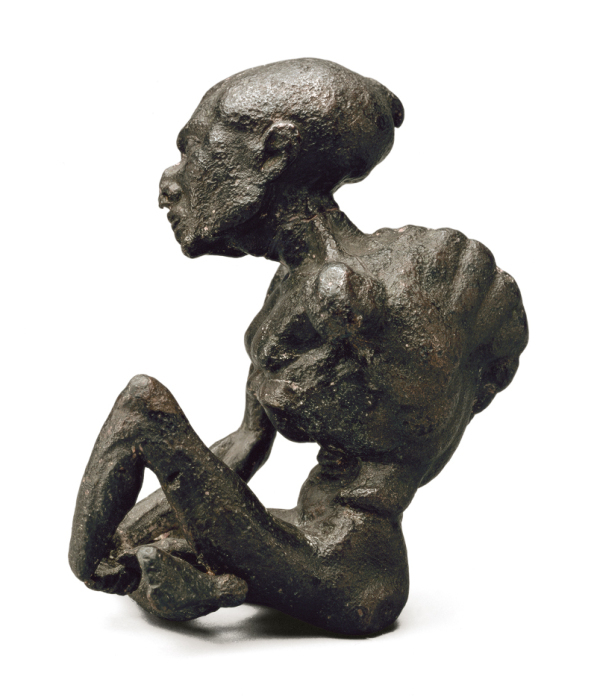 Alexandrian statuette commonly explained as that of a physically impaired beggar (3rd century B.C.?). – (c) Museum für Kunst und Gewerbe, Hamburg. – Image source here. Yet, overall, the poor, marginalised politically and / or socially, remain remarkably silent. Did they have a voice? Were they able to speak, to write poetry, to sing? Or was there nothing but utter silence in Rome’s peanut gallery? Let us give at least some of Rome’s poor their voice and their dignity back – listening to the words of the (self-professed) poor of ancient Rome in poems engraved on stone. Let us listen and yet be fully aware of the fact that there were countless people who were significantly worse off still, people whose voices we cannot ever reclaim, no matter how hard we try. For Cupitia Florentina, his devoted and chaste wife, I, Ianuarius Primitivus, her husband, gave a memorial as grand as poverty would allow. Iunia Baccula remained faithful to the Eucrati sodality, displayed decency, took care of her husband, tolerated poverty, and instructed the children well. Titus Flavius Faedrus for his deserving wife. While still alive, Quintus Egnatius Blandus, freedman of Quintus, had this made for himself and Minucia Urbana, his wife. As much as poverty allowed me to do, I gave you, my wife, when the time had come, this rather too little gift [i. e. the monument] for your merits. She lived without a blame for 28 years. CLE 2087. – Image source: http://cil.bbaw.de/test06/bilder/datenbank/PEC0011033.jpg. vixit ann(os) X[- – -]. pauper et exiguus reddidit infer[ias]. 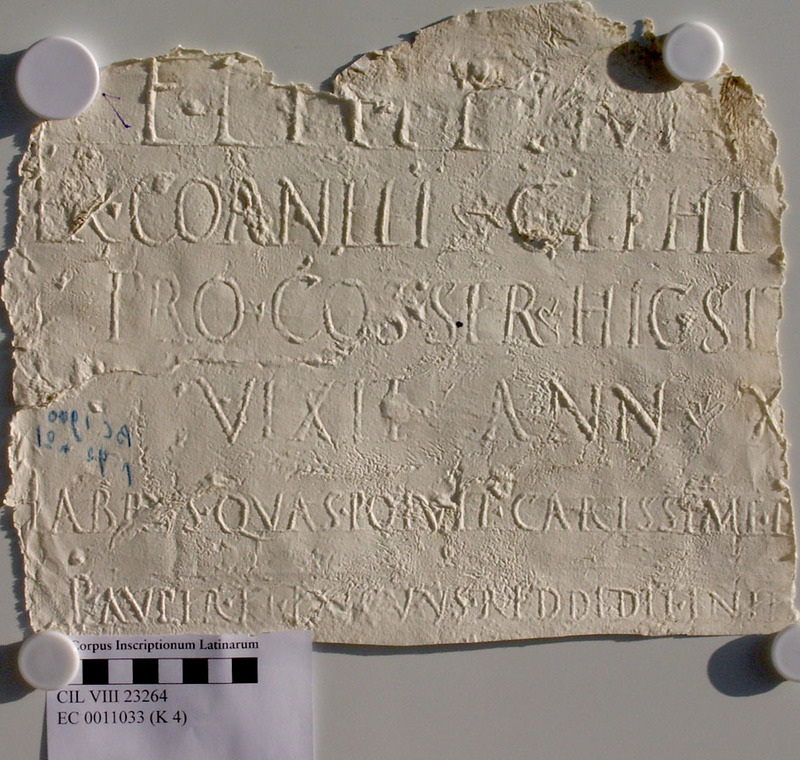 … slave of Servius Cornelius Cethegus, the proconsul, is buried here. He lived [at least 10] years. Habrus (or Fabrus? ), poor and indigent, bestowed this funeral on you, dearest, sweet friend, as best he could. Inscriptions containing only very short poems, from a wide variety of geographical contexts, all united by their desire to assert dignity, decency, education, and the virtuous life – in the face of poverty. In the face of the contempt that the poor experience across time and space (note, for example, this excellent piece by Helen Lovatt on Martial’s poem 12.32, on the eviction of a poor family). via in hoc monumento conditus est viator vale. condi licet nisei eos lib(ertos) quibus hoc testamento dedi tribuique. Stranger, stop and turn your gaze towards this hillock on your left, which holds the bones of a poor man of righteousness and mercy and love. Wayfarer, I ask you to do no harm to this memorial. 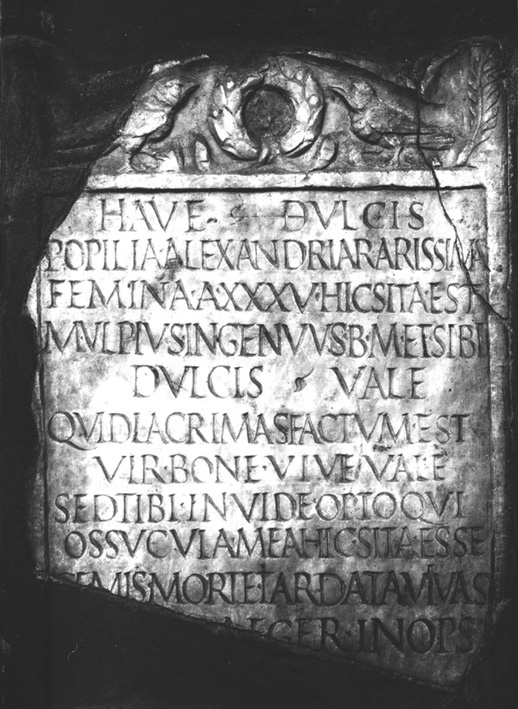 Gaius Attilius Euhodus, freedman of Serranus, a pearl-merchant of Holy Way, is buried in this memorial. Wayfarer, good bye. By last will and testament: it is not permitted to convey into or bury in this memorial any one other than those freedmen to whom I have given and bestowed this right by last will and testament. pau(pe)ris inpositum sustinet arte super. diceris coniunxs una fuisse viri. Carisius Gemellus, freedman of Lucius, for Julia Melania (? ), freedwoman of Quintus. The earth, lighter than the mound which itself is light so that it may not weigh down on the bones, holds above itself that mound laid on it by such skill as a poor man can afford. Junia, memorable among beautiful women, Junia, glory of chaste women while you sojourned (?) on earth, you have been turned into ashes and shut into a cicada’s tomb. You will be remembered as the only wife of your husband. Poverty is said to be a curse. CLE 1299. – Image source: http://db.edcs.eu/epigr/bilder.php?bild=PH0005580. femina a(nnorum) XXXV hic sita est. M(arcus) Ulpius Ingenuus b(ene) m(erenti) et sibi. [- – -] aeger inops. Greetings, sweetness. Popilia Alexandria, a most remarkable lady, lies here, aged 35. Marcus Ulpius Ingenuus had this made for her, well-deserving, and himself. Farewell, sweetness. Why do you cry? It is done, good man, live, farewell. But you, spiteful man, who bemoans that my little bones lie here, may you live, with your death deferred, … sick and poor. Is it possible to escape the curse? Parcarum arbitrio genesis vel lege tributa. tradas, vefes (!) dea Pauperies obnoxia non sit. nomine Dalmatio semper matus ad omnes. Unhappily welcomed here in Dis’ Tartarus, I left the awful granaries and the path of my life behind, and my fate was not entitled to see my children: I left the world above to see the hellish realm, by decree of the Fates or by the law that was assigned upon my birth. As the gods above and those sad altars were hostile to my requests, I offered frankincense, crackling in the flames, to the Spirits of the Departed, a suppliant myself. As my prayers to the gods above remained unheard, I beg you with these prayers, Bato, dearest brother: if you pass to my children, when found, the things with which I have entrusted you, may Poverty, the goddess, mean no harm to you. You will ensure memory of me, lest I be mocked, deep down in the realm of hell, subject to allegations, I, Dalmatius by name, always beloved by everyone. To Valerius Dalmatius, exarch of the horsemen from the stables. Bato, for his father. Is it possible to escape poverty, if left to one’s own devices, as many a populist politician seems to suggest? 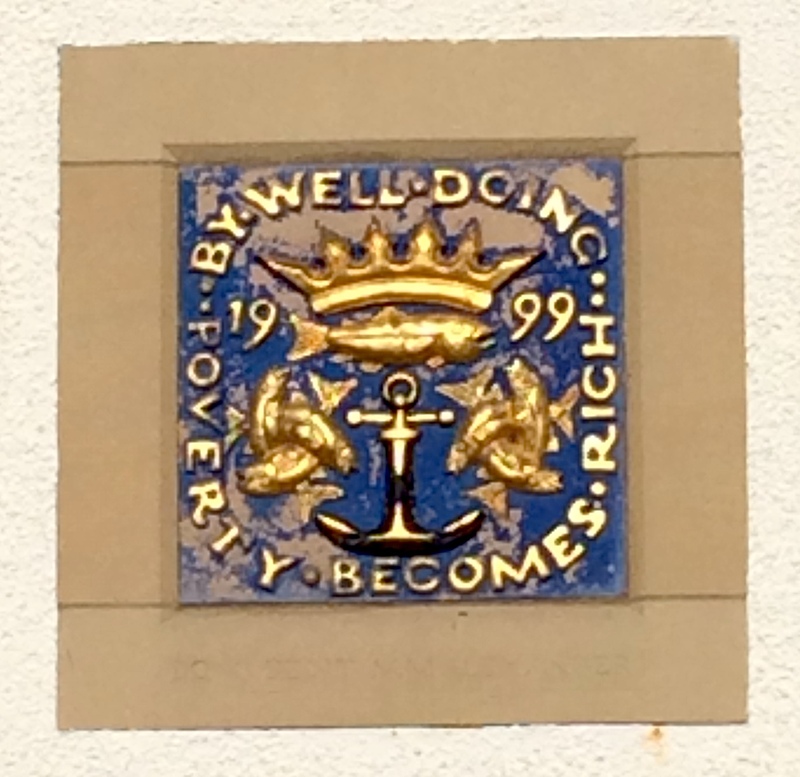 ‘By Well-Doing Poverty Becomes Rich‘ – Plaque at the Scottish Fisheries Museum, Anstruther. – Photo (c) PK, 2015. Inscription of the Mactar Harvester. – Image source: http://cil.bbaw.de/test06/bilder/datenbank/PEC0001162.jpg. I was born into a poor dwelling and of a poor father, who had no property or household. From the time of my birth, I lived in the country looking after my business; there was no time off in the countryside and none for me at any time. And when the time of year had brought forth the grain ready for harvest, then I was the first reaper of the stalks. When the sickle-bearing gangs of men had made their way to the fields, whether heading for The Nomads of Cirta or The Fields of Jupiter, as harvester I preceded all, first into the fields, leaving the packed bands behind my back. I reaped twelve harvests under the raging sun, and afterwards became a work gang leader instead of a labourer. We led the gangs of harvesters for eleven years and our band cut down the Numidian fields. This effort and my frugal lifestyle brought success and made me master of a household and gained me a house, and my home itself lacks nothing. And my life gained the rewards of office: I was myself enrolled among the conscript councillors. Elected by the order [of the decurions], I had a seat in the order’s temple and, starting out as a humble country boy, I too became censor. I produced children and saw them grow into young men and saw their children too. In accord with our services in life, we have enjoyed years of fame, which no bitter tongue has hurt with any reproach. People, learn to pass your lives without giving reason for reproach. The man who has lived deceitfully has earned meeting his death in such a manner. nullo odio sine offensa, missus quoq(ue) honeste. Lucius Trebius, son of Titus, father. Lucius Trebius Ruso, son of Lucius. Born in deepest poverty, I subsequently served as as soldier of the fleet, side by side with the Emperor, for seventeen years, without incurring any hate, without a fail, honourably discharged, too. This plot comprises 16 sq. ft. Success stories like this, however, presumably were the exception in the ancient world– and we don’t know just how much of a persuasive traction such ‘from dishwasher to millionaire’ stories could gain back then. Ideological charged narratives now, they remain the narrative of exceptions to the rule. haud procul ab urbe construxit cenobium s(an)c(t)is. religiosae vit(a)e explevit tempora (!) lustra. Skillful, generous, dutiful, of sharp wit: here in this tumulus rests Sergius, the saint bishop, who, after restoring the ceilings of the sacred temple (which had begun to fall into disrepair), built a monastery for monks not far from the city. He was regarded as parent by the poor, as guardian by the pupils, he meant consolation for the widows, he was valued by prisoners, and he found food for the famished. Easily given to tears, he avoided the contact of meat, beloved by everyone, strong in grace, frugal when it came to abundance, generous to the needy, he lived seventy years of his age and, consecrated as bishop, he completed three decades of his life-time alongside seven decades of a religious life. 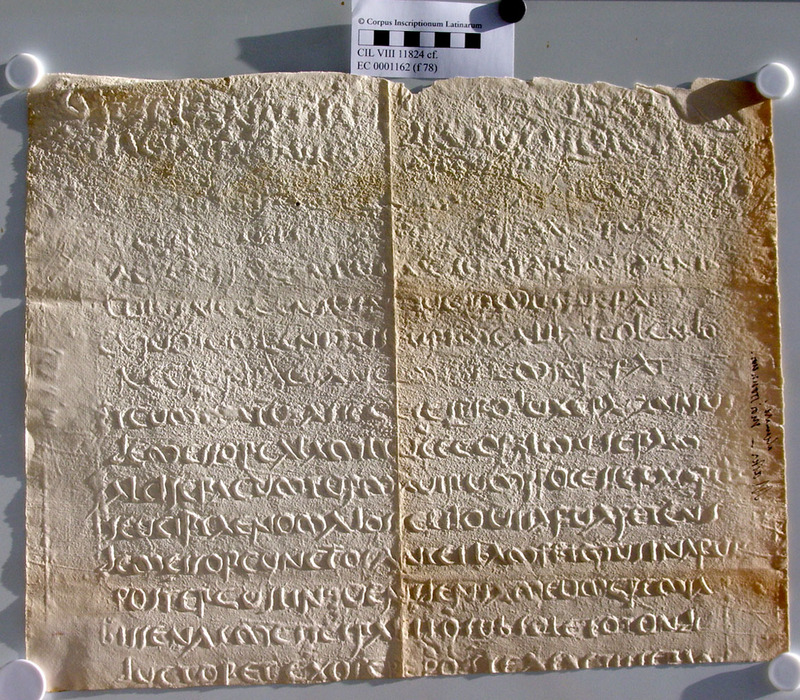 This entry was posted in Carmina Epigraphica, Epigraphy, Poetry and tagged Big questions, Carmina Latina Epigraphica, Early Christianity, Inequality, Latin Inscriptions, Poverty, Song Culture, Sustainability. Bookmark the permalink.